Discussion in 'iMac' started by Alex Hobbs, Jun 11, 2012. Have these parts been accounted for? The last minute leaks all have the correct part numbers for the MacBook Pro and MacBook Air, which means 9to5Mac's list is correct.. So surely that would give us hope that MD101X/A, MD102X/A, MD103X/A, and MD104X/A are still out there? You are on to something... Well spotted. Keeping hopes up. 975, 976, 831 are MacBook Pro's presumable, MacBooks don't exist anymore. Well yes, but why not also comment that they aren't "Air", but "MacBook Air"? Hardly relevant anyway. Doesn't look good for iMacs. No what I meant was if 975, 976 etc are MBP, then why would 101, 102, 103, 104 also be MBP? 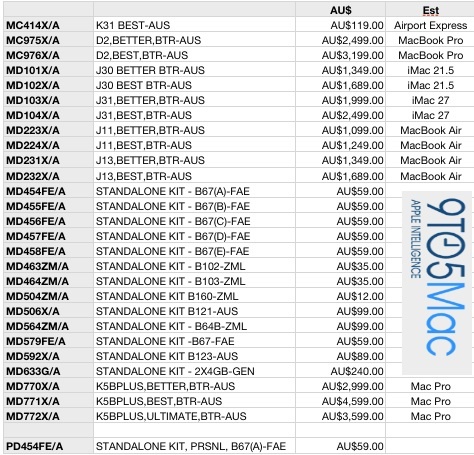 I just checked the prices on that 9to5mac list against the prices of each of the updated mac lines on the Australian apple store - http://store.apple.com/au. Sad thing is, each of the new macs on the website are accounted for on that list as all the prices match. You can check the prices in Australian Dollars yourself. Does anyone have any updates on those accessories? Have they been quietly updated too? It seems to me that given that the iMac is not even on the list, we won't be getting that update.